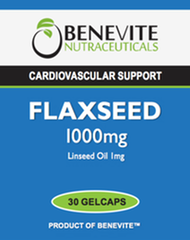 Benevite Nutraceuticals™ Flaxseed 1000mg oil is a rich source of the omega-3 fatty acid alpha-linolenic acid (ALA) which is converted in the body to eicosapentaenoic acid (EPA) and docosahexaenoic acid (DHA). Flaxseed oil helps to maintain a healthy cardiovascular system by maintaining the health of blood vessels, especially the capillaries, and assisting circulation. 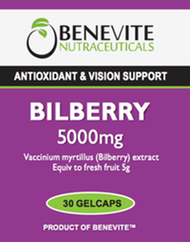 Benevite Nutraceuticals™ Flaxseed 1000mg can help to maintain general well-being. Adults: Take 1 to 2 capsules 3 times daily, or as directed by your healthcare professional. Aids or assists in the maintenance of general well- being. Flaxseed oil is a rich, natural source of omega 3, 6 & 9 essential fatty acids and is likewise a rich source of the omega-3 fatty acid alpha-linolenic acid. Flaxseed Oil may assist blood circulation and assists in the maintenance of healthy blood vessels whilst it maintains health of capillaries. The alpha-linolenic acid (ALA) in flaxseed oil is converted in the body to eicosapentaenoic acid (EPA) and docosahexaenoic acid (DHA). Flax seeds contain high levels of dietary fibre including lignans, an abundance of micronutrients and omega-3 fatty acids (table). Flax seeds may lower cholesterol levels, especially in women. Initial studies suggest that flax seeds taken in the diet may benefit individuals with certain types of breast andprostate cancers. A study done at Duke suggests that flaxseed may stunt the growth of prostate tumors, although a meta-analysis found the evidence on this point to be inconclusive. 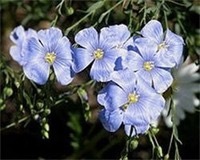 Flax may also lessen the severity of diabetes by stabilizing blood-sugar levels. There is some support for the use of flax seed as a laxativedue to its dietary fibre content though excessive consumption without liquid can result in intestinal blockage. Consuming large amounts of flax seed may impair the effectiveness of certain oral medications, due to its fiber content, and may have adverse effects due to its content of neurotoxic cyanogen glycosides and immunosuppressive cyclic nonapeptides.